Our Tailored Tours can simply tweak one of our standard options to suit the time-frame you have available or a Tailored Tour can be completely written to your specification. We now offer a Mountains Pick 'n Mix which can be taken as a one or two day tailored tour or even combined with another tour such as the Mehedi Special or the Classic Camel Tour to create a longer personalised program. To give you some ideas, two examples of tailored tours that we have organised in the past are detailed below. Other ideas that we have arranged in the past include things like: Private Dinner over sunset, sunrise Camel Trek, Night walks etc. Thank you so much for sharing your desert with us. 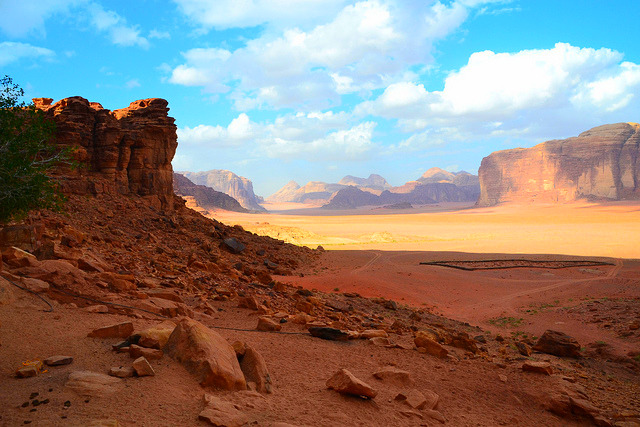 We are thoroughly impressed by the beauty of Wadi Rum but even more impressed by your personal touch. This experience will stay with me for the rest of my life and I am so glad that our paths crossed. 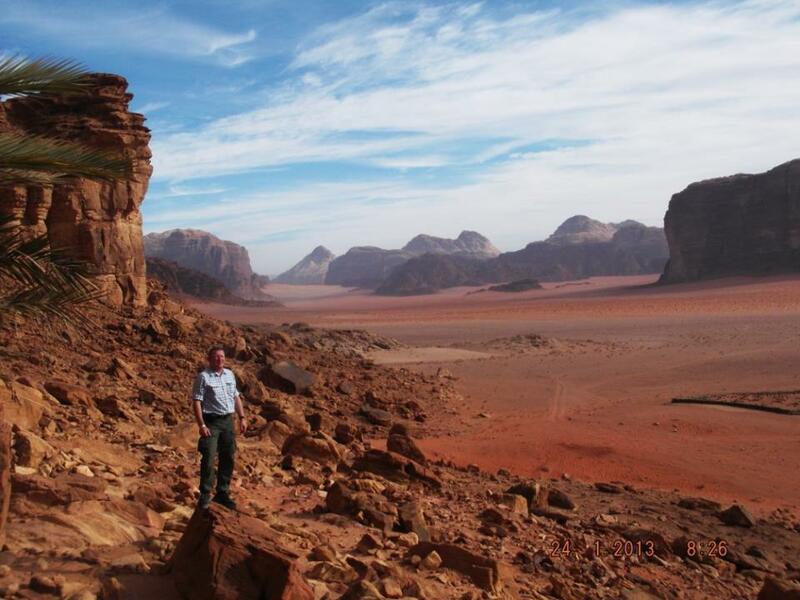 Many thanks to you and the staff and we will spread the word about the hidden treasure that is Wadi Rum with our friends. This is the highest mountain in Jordan and can be hiked in 2-3 hours in a morning or afternoon. This mountain can be added as a half day option on arrival day or departure day. It is often combined with a full day Jeep tour and overnight stay to make a 1.5 day program. This mountain could also be combined with the Jebel Haash mountain, the Burdah Arch hike/scramble or the Rakabat Canyon active hike. This is a natural rock bridge located high up on a mountain. The hike takes 2-3 hours and involves a lot of scrambling so this is not for those who are afraid of heights. For active people this is a great option. It can be combined with a the Mehedi Special Full Day Jeep Tour. Or it can be combined with the Um Ad Dami Mountain, the Jebel Haash Mountain or the Rakabat Canyon active hike. This canyon takes 2-3 hours to hike through and involves a lot of scrambling. It is a lot of fun, but quite challenging. This hike can be combined with a Jeep tour, or Um Ad Dami Mountain, Burdah Arch hike/scramble or the Jebel Haash Mountain. This mountain is not too far from Um Ad Dami. It is in the South of the protected area. Some people argue the view from the top is better than from Um Ad Dami. If you do both hikes you can be the judge. The hike takes about 2-3 hours. This hike can be combined with Um Ad Dami, the Burdah Arch hike/scramble or the Rakabat Canyon Active Hike. The 5JD p.p entrance fee is NOT included. Drinks & Lunch ARE included. Dinner & Breakfast IS included. One night accommodation in my camp (private Bedouin tent) IS included. This tour can start between 9-10am. You need a minimum of 8 hours of available daylight to do the tour. It would usually start from the village and finish in the Camp after sunset. It can also start from the Camp on the departure day and finish in Rum village. 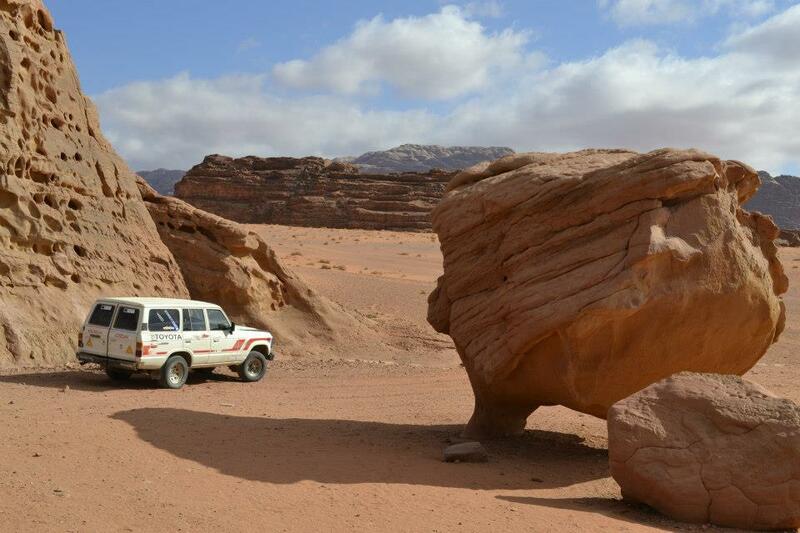 This is an example of a Tailored Tour program we have organised for a group of four people; two preferred to use the Jeep to hike over a larger area of Wadi Rum, two preferred Pure Hiking without a Jeep. They wanted Bivouac Camping included and to finish each day in the same place, camping together as a group. Once you have arrived in Rum Village (recommended by 10am) we will get organised and then I will introduce you to your guide. You will start the morning hike together and then spend the afternoon following a slightly different route. Ending the day in the same place for dinner & your first night Bivouac camping. 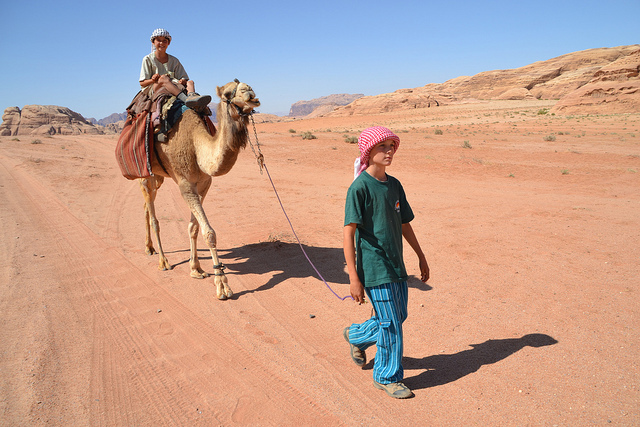 When you are ready all 4 of you will head off on foot hiking with a Bedouin guide through Rakabat canyon. This hike involves a lot of scrambling, you will get dusty and is not for you if you are afraid of heights. If you are fit and enjoy scrambling then it is a great little hike. The hike takes about 2-3 hours. When you reach the other side, you can all have a rest together and enjoy some lunch. After which you will divide into two 'parties'. The first: 'Pure' Hiking. The second: 'Combined' Hiking. Red Sand Dunes This area is very beautiful with many differing colours of rock and sand. You can climb up the sand dune for the wonderful view at the top. Then we like to jump off it & run down it (some silly people also like to roll down it!). Anfishieh Inscriptions Rock inscriptions on the Anfishieh Jebel from the Thamudic and Nabatean periods. Bivouac Camping: Southern end of Burrah Canyon. You will arrive at the Southern end of the canyon where you will be spending the night. If there is time and you want to walk more, you are welcome to explore the canyon a little independently. For the evening a place to sleep will be prepared with blankets, mattresses & a fire. Your guides cooking your dinner for you on the fire. All 4 of you sleeping in the same place. Burrah Canyon North entrance You will then hike through the canyon to finish at a meeting point with your friends for the evening Bivouac camping. The hike is about 1.5-2 hours and you can use the Jeep at any time that you are tired and don't want to walk any more. Bivouac Camping Southern end of Burrah Canyon. You will arrive at the Southern end of the canyon where you will be spending the night. For the evening a place to sleep will be prepared with blankets, mattresses & a fire. Your guides cooking your dinner for you on the fire. All 4 of you sleeping in the same place. After breakfast together at your temporary Camp at approx 7.30am you will head off in two seperate directions for the day, finishing in the evening in the same place to camp together. House of Lawrence A Nabatean structure that Lawrence of Arabia according to hearsay he used during the Great Arab Revolution to store weapons. But without lingering on the possible academia of this site there is a wonderful view from here..
Bivouac Camping: Burdah Arch Jebel. You will arrive at the foot of the Burdah Arch Jebel where you will be spending the night. If there is time and you want to walk more, you are welcome to explore around the area a little independently. For the evening a place to sleep will be prepared with blankets, mattresses & a fire. Your guides cooking your dinner for you on the fire. All 4 of you sleeping in the same place. You will set off from your temporary camp at Burrah Canyon by Jeep. Driving through the spectacular white desert & down Nograh Canyon/valley. The drive is about one hour, and then you will reach Um Ad Dami. Um Ad Dami at more than 1,800 meters is the highest peak in Jordan, offering you a whole new perspective of the desert from its summit. According to your ability climbing to the summit and back to the desert floor takes approximately two - three hours. You can see the border to Saudi Arabia from the top. We then enjoy a rest and some lunch. After lunch you will drive to the foot of Jebel Haash. Jebel Haash is not as steep as Um Ad Dami or as high, but many people argue the view is more beautiful... you can be the judge today. The hike is about 2 hours. After which you return by Jeep to the place where you will camp together for the night. Bivouac Camping Burdah Arch Jebel. You will arrive at the foot of the Burdah Arch Jebel where you will be spending the night. If there is time and you want to walk more, you are welcome to explore around the area a little independently. For the evening a place to sleep will be prepared with blankets, mattresses & a fire. Your guides cooking your dinner for you on the fire. All 4 of you sleeping in the same place. After breakfast together at your temporary camp at approx 7.30am you will leave together with your guide to hike up to the Burdah Arch. Burdah Arch The Burdah Arch sits high on top of its Jebel (mountain). The hike and scramble to the top takes you through the liquid like rock formations and some sandy areas high up on the mountain acting as little habitats for Flora and Fauna. After reaching the top and perching high up on the natural rock bridge you can return to the desert floor. Please note this hike involves a lot of scrambling so a good head for heights is needed. The hike takes about 2-3 hours. After which you will all relax together to enjoy your lunch. To the Camp Enjoy a delicious Bedouin dinner, the stars and the night in the desert. In the Camp we have Bedouin tents (private), with mattresses and blankets. We have toilets (two Western) and two showers (cold water/sun warmed). We have a main tent with a fire for sitting and relaxing in. The Camp is in the white desert in a unique and beautiful location, secluded and away from any other tourist camps. **If you are getting tired the guide can cut the route a little shorter to hike directly to the Camp after the Small Sand Dune. After breakfast in the Camp at approx 7.30am we return to Rum Village by Jeep for your onward journey. Usually arriving 8-8.30am. 4 adults: 3 days , 3 nights. Included: 3x Lunch, dinner & breakfast, drinking water (bottled water), Bedouin tea. Some kind of juice drink at lunchtimes. Bedouin Guides for the hiking, mountains, scrambling etc. Guide to cook dinner each night and some lunches. Day 1 & 3 lunch: cooked. Day 2 lunch: picnic. Use of Jeep/s for the program, and as support for the Bivouac camping. Carrying the equipment, food etc. Setting up sleeping place etc. Use of mattresses, blankets etc. One night in the camp: Private Bedouin tent: 2 x 2 person. This program is designed so you can use Camels to carry everything, playing the role the Jeep would normally play on a longer hiking tour. This way you will not use the Jeep at all (only on the last morning if you want it). You will need at least three Camels to carry everything (depending on how many people you are) and you will have two guides: a walking guide, and a Camel/cook guide. The Camels and Cook will go ahead in stages to the lunch place and sleeping place. Sometimes they will follow your hiking route alongside you and sometimes they will go ahead. Arrival in Wadi Rum. Recommended by 10am. We will meet at the Guest House in Rum village and you will begin your hike from here. Visiting along the way some key sites and then heading out to spend your first night in my Camp. Other nights you will be bivouac camping in the desert with your Camels, walking guide and cooking guide . The cooking guide will set up the camp in advance of your arrival. We provide mattresses and blankets, your dinner will be prepared for you on the fire. The evening spent star gazing. During the day you will stop for lunch in a beautiful spot, your guide usually preparing some Bedouin tea on the fire. Lawrence Spring Walk up through rocks and boulders to find the water (and a lovely fig tree to rest under). During spring time you are greeted by the heady smell of herbs.. The view across the Wadi from here is legendary! Small Sand Dune The view of the Wadi Rum valley from here is excellent. You can climb up the sand dune for the wonderful view at the top. Then we like to jump off it & run down it (some silly people also like to roll down it!). Khazali Canyon This canyon was once used by the local Bedouin to rest in the shade, especially in the hot summer. You can easily imagine how it would have looked with Bedouin tents, families resting, drinking tea, and children playing. You can find on the canyon walls many ancient rock inscriptions (see if you can spot the inscriptions of feet, and the Orynx). El Qattar Spring This natural spring is set up in the mountain, and you can see what the Bedouin have done to catch the water. There is a Bedouin Graveyard and a lovely view across the valley where you have walked. The Camp Enjoy some dinner, the stars and the night in the desert. In the Camp we have Bedouin tents, with mattresses and blankets. We have toilets (two Western) and two shower's (cold water/ sun warmed). We have a main tent for sitting and relaxing in, in the evening. The Camp is in the white desert in a unique and beautiful location, secluded and away from any other tourist camps. Today we will walk through the white desert East until we reach the Um Frouth arch around lunchtime. We will stop for some lunch and then continue walking East through the desert until we reach the Burdah Arch Jebel. Bivouac Camping: Burdah Arch Jebel. You will arrive at the foot of the Burdah Arch Jebel where you will be spending the night. If there is time and you want to walk more, you are welcome to explore around the area a little independently. For the evening a place to sleep will be prepared with blankets, mattresses & a fire. Your guides cooking your dinner for you on the fire. After breakfast today you will climb up to the Burdah arch with your guide. This is a natural rock bridge located high up on a mountain. The hike takes 2-3 hours and involves a lot of scrambling so this is not for those who are afraid of heights. At the end of the hike you will have some lunch prepared for your by your guide. We will then walk through the desert to Burrah Canyon, where we will spend our third night. Bivouac Camping as detailed for day 2. To Um Ajil: For the night: Bivouac Camping. In the morning you are taken by Jeep back to Rum village for your onward journey. Usually arriving by 8.30am. If you have time and you like scrambling you can also 'Add' On the hike through Rakabat Canyon for an extra 40JD. The start of the hike is close to where you spend the night. The hike takes about 2-3 hours so if you start after breakfast by 8.30am you will arrive in Rum Village by 11.30am.